Thanks for that RS, good info one one but I can't get into the european forum, it just keeps chucking me back to the log-in page my french is not good. Maybe I could if I won the lottery, I don't have that kind of money. My skis were collected the other day (ebayed for 2.65!) so I've got enough for severall plates, some of them WIDE. I've even ditched the idea of new trucks and got my local skate shop collecting old wheels and trucks form me. I had a chat with the owner and he's well interested in the idea but finding 4 matching trucks and 8 wheels will take a while. Not only is it cheaper but the idea of recycling parts appeals to me too. You don't need to win a lottery...a few $ here and there will do it. As you can see they have had extreme abuse & mileage and they'll probably out-live me.....lol. Wheels are also by preference. If you do a lot of fast turns where you don't want to slip then go with a soft wheel - hard to push but stick like glue. As for plates, they must be durable....many styles on the market and as long as they hold together that's good enough for me. I find larger/harder axles more important than plates as they take a beating if you're doing jumps. Wider trucks are another option. Myself, I never had a use for them....if you fall over sideways on a std width truck, a wider stance isn't going to help you.....but an airbag will. I've seen loads of guys with all the best equipment look like fools and guys with wooden wheels put them to shame. I'm all for inovation but just how much better is that $400 plate than the $40 one? Sure better hardware helps but it gets to a point where that little bit better isn't worth Jack! I'm a firm beleiver that extreme vert is 99% ability and 1% special hardware! the holes up front mean nothing on making the plate stronger. adding the toe mounts makes it enormously stronger on toe slides! True. Hole for stopper in front of skate does not weaken plate. However, it does shorten your wheel base. they will last 20 yrs w/ them (stoppers) on, 1 year w/ them off. What will? Your boots? The plates? If you mean the boots, you could protect the toe of your boot with a cover. what works for biff, or me, might be right/wrong for u. Absolutely true! Always do what works best for you. Truer words were never spoken!!!!! I've never spent too much on vert skates. They get destroyed too quickly. The most expensive item on my skates are the skateboard trucks. And I have re-used them when my boots wear out. Just mount them on new (or new to me) boots. I almost always buy used. the plate, mine started to split til i put on the toe stop mounts. the metal plate started denting and pulling away from the wood layer. i love my plates. the toe mount totally protects them. as far as wheelbase, mine is perfect. i wouldnt want the trucks more forward since i cant turn with them in front of the base of my toes. i prefer the tight little bowls and love carving the most. 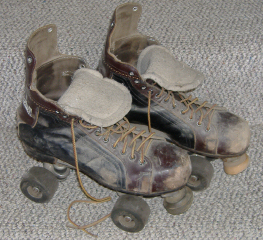 most US sk8rs have them this way, most european have them ur way. probably better ur way if vert ramps are ur thing. i prefer the bowls and carving rather then straight up and down. the metal plate started denting and pulling away from the wood layer. Wood Layer???!!! Your plates are layered with wood in them? If you added the wood layer yourself, consider using a much harder resilient wood, or a different material altogether. As far as a plate goes, if you do not use the stopper holes (like me), I'd suggest cutting them off (the entire stopper attachment area on the front of the plates). If your plates do not stick out past the front of your boot, then you wouldn't have a problem with damaging your plates. This also lightens your plates, as well as allowing a longer wheel base for those who like the longer wheel base. try tracker plates, no i'm not going to distroy them!! I cannot even find Tracker plates. All I can find online is Tracker trucks. Can you post a pic? here are my tracker plates, tracker trucks, UHMW sliders i designed/cut. these are the best freaking sk8s for me anyways. just not happy w/ the boot. too wide on heels and pinches my toes since my toebox is more square. did many mods on heel, sewn in 2nd heel strap, padding, etc. might try bont boots next time the riches pass through. they do not make tracker plates anymore. i was an extremely lucky gal!! they r the lightest thing around. no i wont take off the toe mounts, ever!! 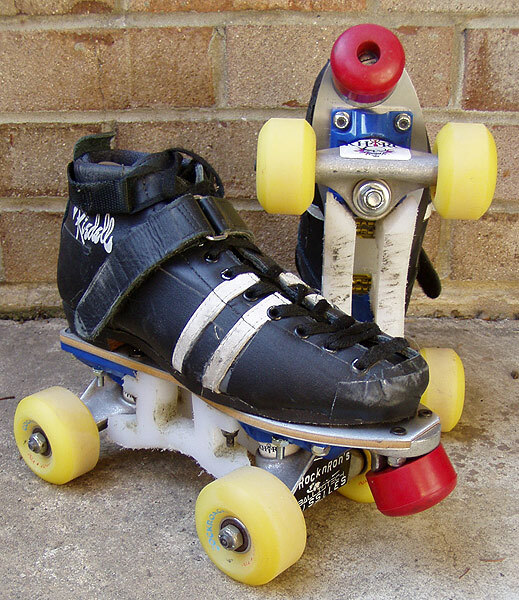 i have 2 sets, one on my street sk8s too. they have to last me a lifetime. here are my tracker plates, tracker trucks, UHMW sliders i designed/cut. Those are amazing! I've never seen plates like these......EVER! Where on Earth did you find them?? they arent for sale. very rarely r they on ebay but last time was for $400. its who you know. i promised not to ruin them by doing dumb street stuff, kept my word so taking great care of them so they outlive me. one set i got off ebay. I see the toe stops for sale at the link you posted, but where are the plates themselves? Do you make your own plates for those things?? Thanks for the link, btw! That is so cool. mounts fit on any plate. again, find plates is lucky pretty much on ebay or a machinist. We are offering a limited number of standard, 356 Aluminum plates as well as the super hard to find yellow magnesium plates. that I would be able to buy the plates. But apparently, they are calling the toe stop piece a "plate". But apparently, they are calling the toe stop piece a "plate". Oh wow, I thought they were selling plates too as some deal. Sorry to get anyone's hopes up. Don't sweat it! You actually brought a good thing up. I might still buy the stop part and make my own light weight plates. However, it does not look like something that would be very effective for vert. You are so very welcome!! Any questions at all, let me know. You can also 'PM' me for info. I'm tending towards toe stops as I signed up as a derby ref for a crash course in skating (although I must admit that being surrounded by women was a big factor too). I've started learing with stops, I prefer sprint starts to duck walking (much better acceleration) and find derby stops easier than hockey stops; my main concern is taking my teeth out whilst grinding but that running up walls thing sounds soooo good. How difficult is it to switch between "no stop" and toe stop? I really enjoy derby (men's uk leauge has just been born, my god it's fun) so I will be using them indoors alot, will it be a pain to switch between the two? The best news is that one of the derby lads has a workshop so I can build as soon as my boots arrive, curse that international shipping time lag thing.